As we kick off our Autumn Winter 2018 season, we officially welcome Magpie Goose as the Finders Keepers Artist Program recipient. Magpie Goose have worked in collaboration with Bede Tungatulum on the distinguishable Tiwi Bird illustrations seen across this seasons national branding. Don’t miss Magpie Goose at Sydney Finders Keepers this Friday to Sunday, especially after their impressive debut in Brisbane last summer. Customers could barely squeeze into their stall to pick up a signature piece! Tell us about how Magpie Goose works as a fashion social enterprise? As a social enterprise, all our profits are reinvested back into our social mission. 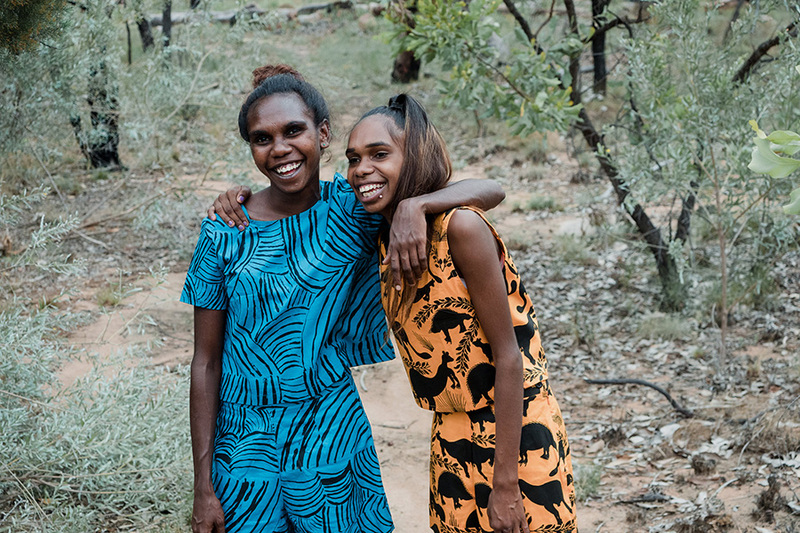 Magpie Goose’s aims are twofold: to share and celebrate Aboriginal art, stories and culture through fashion, while creating economic and enterprise learning opportunities for Aboriginal people in remote Australia. We aim to grow Magpie Goose in a really inclusive way, and see opportunities for Aboriginal people in remote Australia to be involved in textile design, screenprinting, modeling, content development / story telling, photography – or anything else that aligns with their interests! 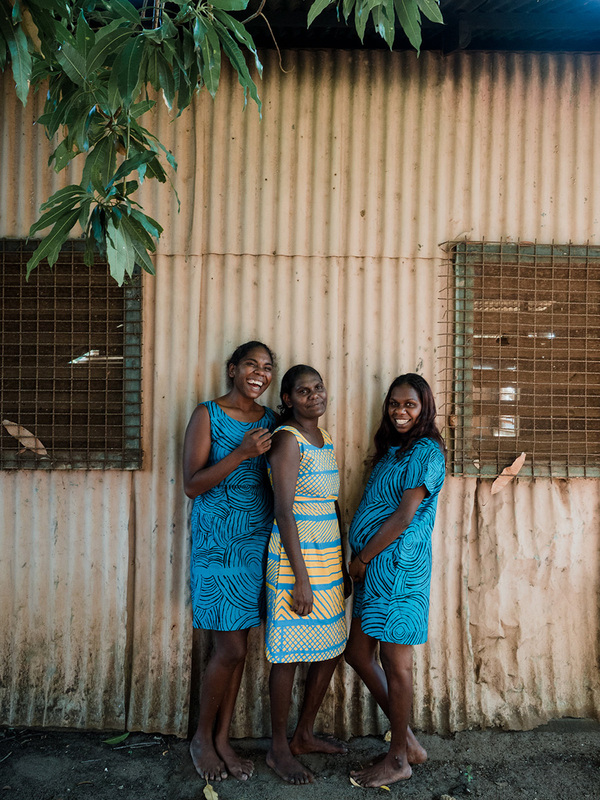 We support the current players in the field of Indigenous textiles, sourcing fabric that is designed and hand screen printed by artists from Palngun Wurnangat Aboriginal Corporation in Wadeye, Injalak Arts in Gunbalanya, Tiwi Design in Wurrumiyanga (Tiwi islands), and Babbarra Designs in Maningrida. All these art centres have been doing incredible work with Indigenous textiles -with many printing and designing since the 1960s. By providing a market for their designs and fabric, we provide art centres with working capital to continue to produce their fabulous work. Magpie Goose is also working to create opportunities for artists and communities that are interested in engaging with textile design but don’t currently have art centre support and/or access to screen-printing facilities. Last year we worked with textile designers Millie Shorter and Tim Growcott to provide design workshops for artists from Borroloola and Urapunga (some of these designs make up our ‘After the Rains’ collection we launched in March). We also trained up five local jobseekers in Katherine to learn screen printing, and printed over 800m of the new designs for our March 2018 range. 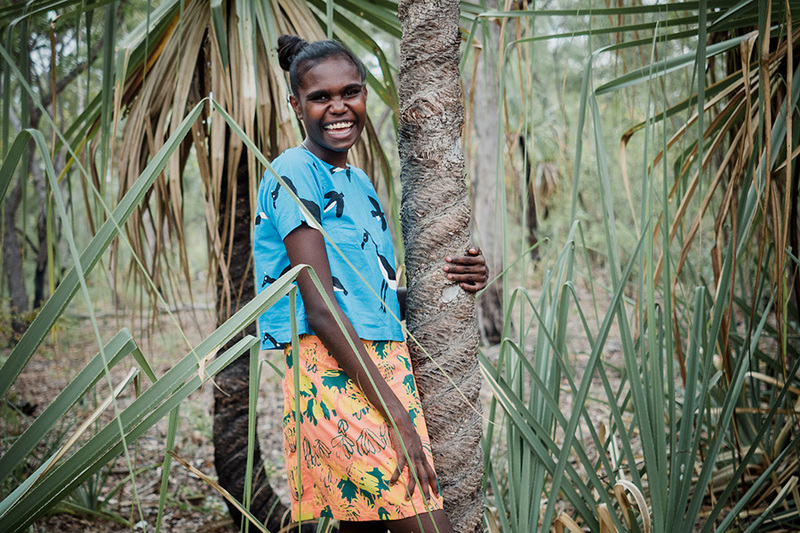 We’re planning to facilitate more design workshops with Central Australian communities, communities in Far North QLD, and the Kimberley – so that we can connect more artists with textile designers, screenprinters and the fashion market! Ideally we’re able to resource flow on opportunities such as returning to the communities with the clothes, and working with people to document the stories of their designs, their aspirations and their community, and even get people to model and shoot the look book and photos for the online store! We had an exciting project in December 2017 where we provided a brief to the recently formed Kalumburu Photography Collective. ELP has been working with Kalumburu for a number of years to support women in the community to realise their aspirations through enterprise. The collective of five women received a brief and a budget with which to execute the shoot. They engaged models and did a series of photo shoots over a number of days – the results were so good!!! As a result of this collaboration, Magpie Goose has been invited to Kalumburu (the most North West part of Australia) to run some textile design workshops. This means the women involved will eventually be able to model and photograph their own designs! What was your inspiration behind selecting the beautiful Tiwi artwork of Bede Tungatalum’s for our AW18 poster? 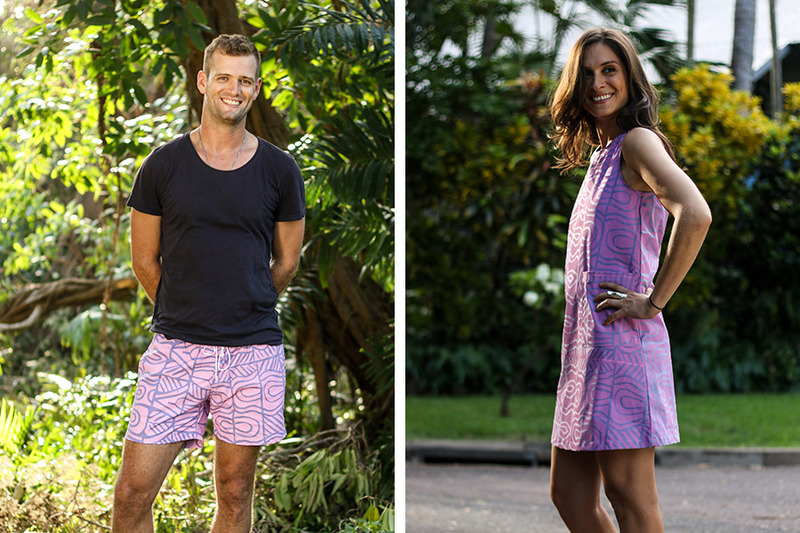 We featured Bede’s Tiwi Bird design in our first collection. We love the simple, classic make up of the design – it’s very powerful. The geometric design is very emblematic of Tiwi artwork. This one started out as a wood block print way back in the day, when Tiwi people were first introduced to printing as a new method of sharing their traditional art. I love the way that all of the lines and dots and triangles are representative of different things – snakes, waterholes, rivers, etc. 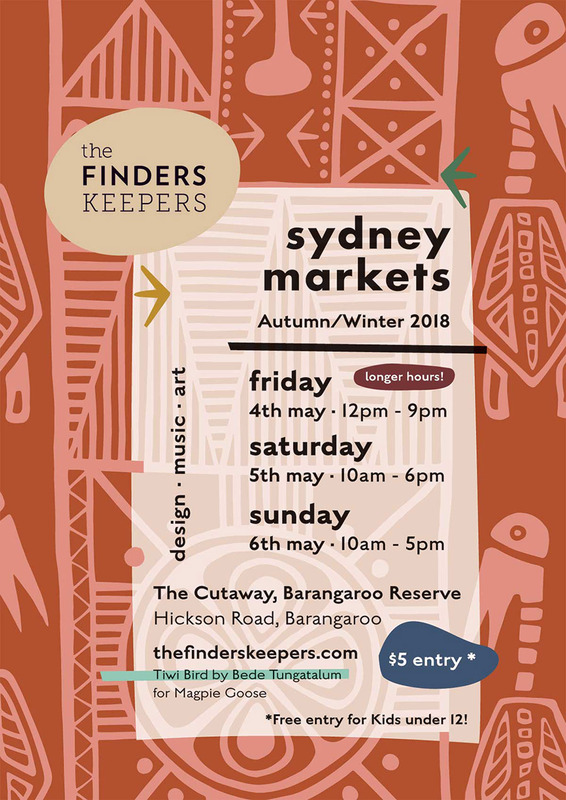 We thought it would be a good, classic print that could be done up in a few different colourways to would work well across the Finders Keepers Market promotional material! Trinita Bundamurra wears Babbarra Designs Dora Diaguma ‘flying magpie geese’ print box top, and ‘kun-ngol /clouds print a line skirt captured by Maria Maraltadj. 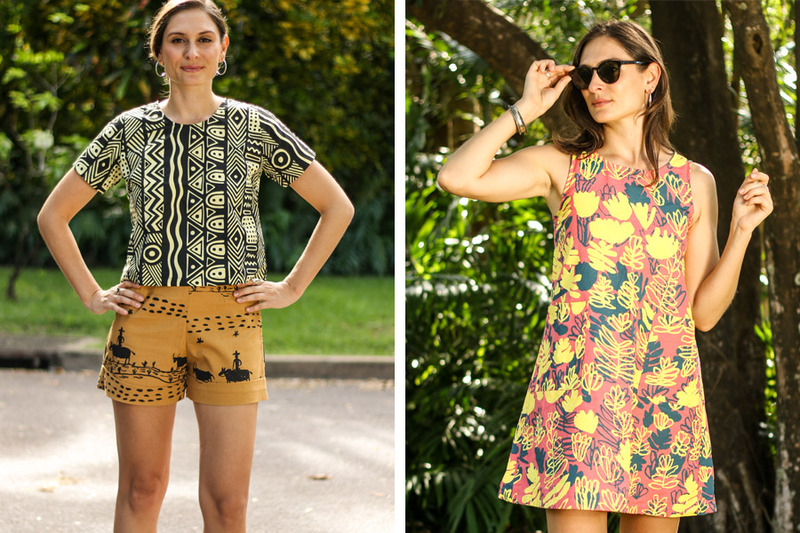 Neda Vanovac wears Angelo Munkara Yuruwli (mangrove worm) print box top- Tiwi Design; Stewart Hoosan (from Borroloola) ‘ringer’ print shorts – designed in Katherine (left) and Elizabeth Kandabuma (Babbarra Womens Centre, Maningrida) a-line dress (right), captured by Jack Bullen. What advice would you give aspiring artists who are looking for a career in the arts? I trained and worked as a lawyer, and Laura studied economics and works as a social entrepreneur supporting enterprise and business. So we haven’t had a traditional pathway into a ‘career in the arts’. Maybe there’s some advice in that – there are many potential pathways and you can be guided by your ideas and the opportunities you come across, rather than being locked into any prescribed path. Advice for someone looking for a career in the arts would be the same advice we would give someone starting a business – find your critical point of difference (what draws people to you? what makes you different from what else is out there? ); market test your ideas and products early on so you can get feedback and figure out if people actually like what you do! ; and don’t be afraid to fail! 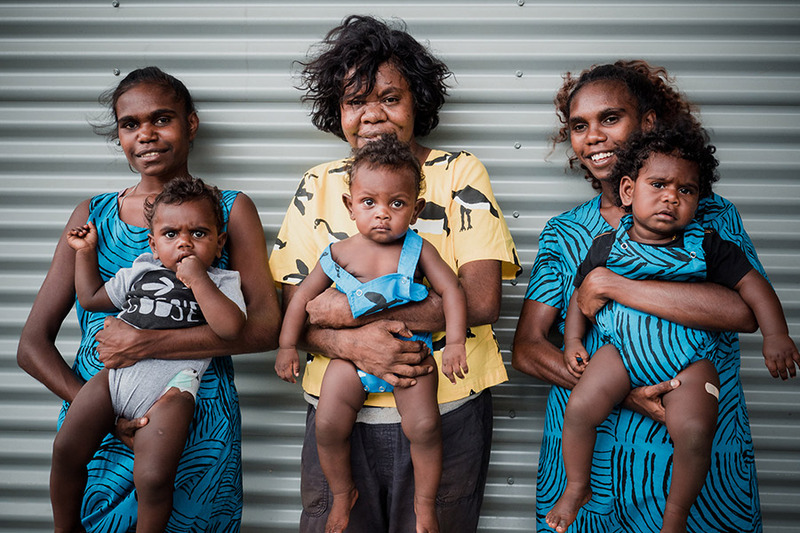 Zerika Clement and Molly Rex wear Leonie Melpi ‘waves’ print shorts (Wadeye) and box top; Injalak Arts Graham Badari ‘rock wallaby and echidna’ print singlet and shorts, captured by Freedom Garvey. Describe your favourite creative project or moment to date. We loved working with four artists in Katherine in August/September 2017 – to provide a space for them to get their designs out of their head, onto paper, and then onto screens and printed onto fabric. It was so exciting to see that creative process, and then to see their reactions when they saw their designs on clothes. It’s a whole new way for these artists to share their traditional stories, cultural assets, and personal history (e.g. of going fishing with grandparents, collecting bush tucker with family) with a wider audience. An exciting new model of story telling.